This is me Sarah mum of 3: Bop it! We received a Bop It XT in our final Toys R us Toyologist box. I remember the old Simon Games from the early 90's. we had lots of fun with this game when I was growing up and it kept me and my sister and mum and dad entertained many many times. and bop it is of a similar nature, with Simon you had to remember and copy the sequence of lights, with Bop It you have to press, pull spin the correct section and keep up with the commands. there are 6 different action points including a shake which you can switch off to make it abit easier! The idea is simple, but its not that easy! its aimed at 8 and above, although younger children can join in too, my 4 year old is slowly getting better at it as he learns the sequences, and he still has fun with it even if hes not beating any high scores. There are 4 different modes of play on Bop it XT. Solo play which will count your score and remember it till next time, and the idea is to compete and progress until you reach a score of 100. When you receive Bop it it only has the novice mode of play, but as you progress with it and master the solo play you will unlock harder modes. There is also more fun based modes such as Pass it, Party and 1 on 1. these all have the same concept but no scores are counted. In party mode bop it will included body parts in which you need to press the Bop it with, which adds to the fun element. In one on one, two people can hold Bop it at the same time and each person is responsible for two activation points. There is plenty of modes to keep you entertained and 4 difficulty levels to unlock, novice, expert, master and pro which each add in an extra element such as using the colours instead of the action words as commands. so Bop It XT will keep you playing for a long time. It really is one of them addictive fun toys which will be used over and over again, a perfect present for teenagers or younger children, or even the granparents will have fun with this. Priced at £23.99 I think its good value as it's something which is sure to get alot of use and looks to be hardy enough to last many many years, these sort of toys are timeless and can be brought out every Christmas or birthday occasion and keep on entertaining everyone, Chloe took Bop It to school one play day and as soon as she walked into the playground with it there was a huge crowd of 8 -10 year olds all desperate to give it ago, so it does seem to be a very popular toy and I'm sure would be much appreciated if left under the Christmas Tree this year. Simon!! I loved that - think my kids my find the new version a bit challenging, but one for the future! 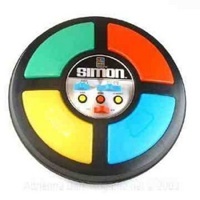 I used to love Simon as a kid. Good day! This post couldn't be written any better! Reading this post reminds me of my good old room mate! He always kept chatting about this. I will forward this post to him. Pretty sure he will have a good read. Thanks for sharing!